Michael Emenalo did not mention Mourinho's name during his Chelsea TV interview - referring instead to "the manager"
Chelsea's players were not to blame for manager Jose Mourinho's sacking, says technical director Michael Emenalo. Emenalo said there was a "palpable discord between manager and players". Asked about the role of the squad in Mourinho's exit, he told Chelsea TV: "It's very easy to make that inference but it is not one the club accepts." Emenalo said the squad consisted of the same group of players who won the league and League Cup "in style" last season while "sweating tears and blood". He added: "The players have a responsibility to go out and prove everybody wrong and show a commitment to the decision that has been made to try and get the club up the league table. "This club is in trouble and something needed to be done." 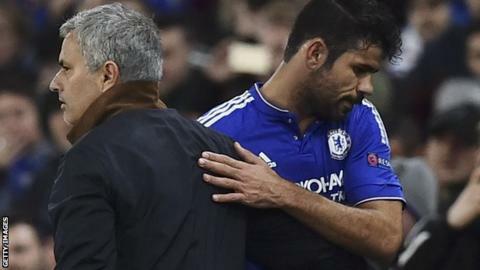 Following Monday's 2-1 defeat by top-of-the-table Leicester City, Mourinho said his "work was betrayed" by his players, with Foxes forwards Jamie Vardy and Riyad Mahrez both scoring. Earlier this season, he said some of his players had shown an "unstable attitude". Midfielder Cesc Fabregas - who in November denied there was a player revolt - said on Tuesday the players need to justify their "big wages". Chelsea face fellow strugglers Sunderland at Stamford Bridge on Saturday and Emenalo said "competent people" would "help with preparation for the game". Former Nigeria international Emenalo, who first joined the club as head opposition scout in 2007, added: "You're not a big club if you don't have contingency plans for situations like this. "Make no mistake about it, the club is working vigorously and actively to make sure a managerial appointment is taken care of as soon as possible." Who is to blame? Players? Manager? Or both? "A real champion keeps going, this lot have thrown the towel in." - Martin Keown. The former Arsenal defender added: "I'm disappointed for Mourinho. He's been brilliant, but this has been a disaster for him. Maybe he got too close and the players were told some home truths they couldn't accept. "It's almost imploded in front of our eyes. It was astonishing the way his players capitulated against Leicester. I saw players that weren't really giving everything. "The respect had gone, and it's easier to change the manager than it is 22 players." Former Chelsea striker Chris Sutton: "The truth is there are a lot of enormous egos in that dressing room and some of them have downed tools. It is not acceptable but it is nearly always the manager that carries the can. Former England captain Alan Shearer: "Eden Hazard - player of the season - wouldn't get in a second division side now the way he's playing. "I have never known a capitulation like it. The players have just not performed and have a lot to answer for. They've let the club and the manager down." Former Liverpool defender Jamie Carragher: "No group of players of that quality should be performing as they are. "I'm a massive fan of Jose Mourinho but, with the results, something had to change. The only way you can change it right now is change the manager. It was the only decision the owner could make really." Former Arsenal striker Thierry Henry: "The players should be held accountable. What happened in some of the games is not all down to Mourinho. There was a lack of desire and commitment. "You can't sack the players, so go for the manager. I am now thinking if I am going into the right profession." Sun journalist Rob Beasley: "If you watched Eden Hazard the other night at Leicester, if that wasn't a guy that showed no guts or stomach for the fight I have never seen one. "When you have players like that, you are going to have problems as a manager no matter who you are." BBC radio presenter Garry Richardson: "This is a quote from Mourinho - 'I've got a couple of bad apples that are causing me a lots of problems and it is a very difficult situation to handle for me". "If you create a snake in the camp, you've only got yourself to blame." - Martin Keown. While not sparing the players, Keown also felt the manager had to take his share of responsibility, adding: "He didn't seem stable right from the off. He was on a campaign where he fell out of love with his players. "This has been an accident waiting to happen. He talked about betrayal this week but back in October he was talking about rats in the camp. You can't be people's mate one minute and their enemy the next." Former Liverpool midfielder Jamie Redknapp: "After Monday's result against Leicester, when words like betrayal were used, you felt there was going to be an ending where the manager has to leave. "It's always light and shade with Jose but it just feels this year there's been a lot more shade. A lot of players who have fallen out with him will be pleased to see the back of him." Sun journalist Martin Lipton: "There is no doubt that the interview post-match on Monday was inflammatory at best. I don't know how he could have got on the bus back after that, the atmosphere would have been poisonous. Some of the things he has said have been foolish beyond belief." Daily Telegraph journalist Jason Burt: "When Jose Mourinho went in 2007, it was basically civil war at Chelsea. "This time, it has not been like that. If anything the club has probably tried too much to help him, but results just haven't been good enough."